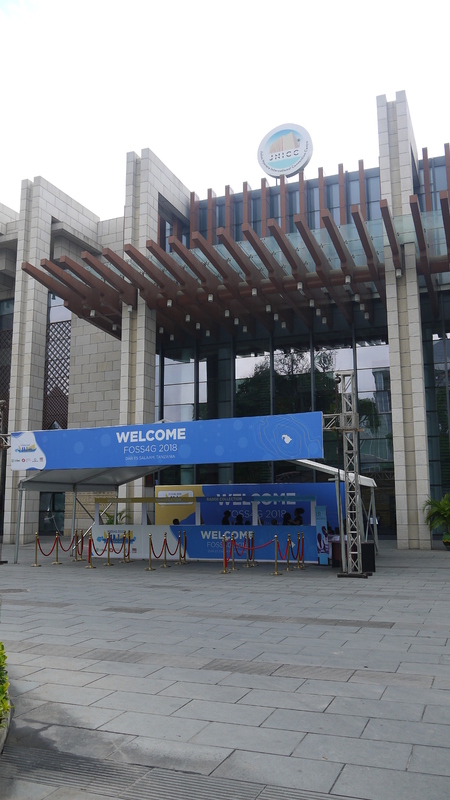 “Leave no one behind” was the motto of this year’s FOSS4G conference, which took place from 27th of August 2018 to 2nd of September 2018 in Dar es Salaam, Tanzania and after Cape Town 2008 this was the second FOSS4G on the African continent. True to the motto of the conference, the Travel Grant Program initiated by OSGeo and the local team made it possible for 130 of the more than 1000 delegates to participate getting a free ticket and financial support for travel. This really made this African FOSS4G one of them, as the majority of participants came from Tanzania and the surrounding countries. The noticeable mood of optimism towards Open Source was also reflected in the conferences’ program. 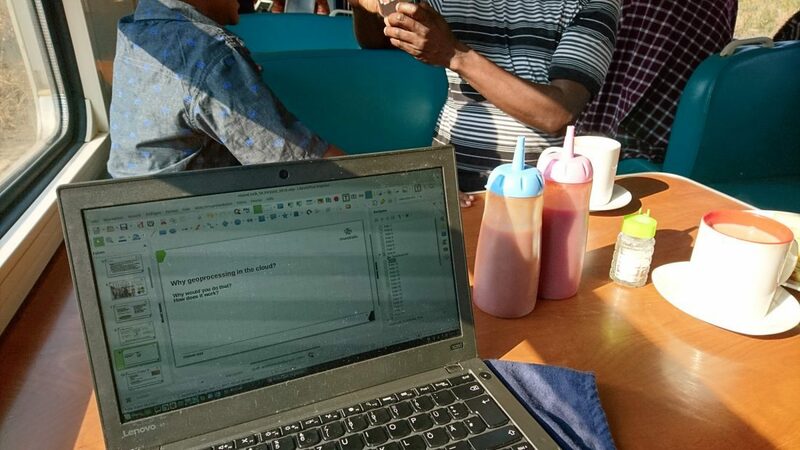 Many contributions showed how Open Data can be made usable with Open Source software under the given conditions, such as unreliable Internet connections or inaccurate or incomplete data. Many case studies were presented in which Open Source was used to set up local geo-information systems, for example for the creation of a cadastre. “We as politicans need geospatial information for our decisions” these were the introductory words of the Tanzanian Minister for Environment, January Makamba, in his opening speech. With his contribution “Approaches to WebGIS in times of unstable or weak internet connections“, Till Adams addressed a problem that is not restricted to Africa. Best practice tips regarding performance and optimization of web-based geo-information systems were summarized. In a second part he presented modern methods that deal with the topics in the spectrum of the keyword “offline”. Many of the problems of most African states, such as the degradation of forest or bush land, uncontrolled urban growth or cultivation of large mono-cultures, are sufficiently well known and were omnipresent as Till traveled from Namibia to Tanzania traversing the African Continent on his way to the conference. In addition to pure monitoring of such changes, geo-information systems help to make this information available to decision-makers. By using Open Source Software, local know-how can be built up because the underlying source code is accessible. The knowledge and the applications are retained locally and usage can be continued, even if specific projects come to an end. In addition to the focus on known problems of developing countries, another focus was also placed on the social problems of the continent such as lack of preventive health care, unequally distributed educational opportunities or child labour and gender inequality. For many years, the Open Source Geo-Community has demonstrated that knowledge is a commodity that can be shared and through which humanity as a whole can benefit. The prerequisite for this is the source code which is nothing other than codified knowledge. Another highlight was the presentation of the Sol Katz Award. This year the award went to Astrid Emde. The Sol Katz Award for Geospatial Free and Open Source Software is presented annually by OSGeo to people who have taken a leading role in the OSGeo community. Through their activities, the award winners have made a significant contribution to promoting open source ideals. At the end of the conference the traditional hand-over to the organizers of the upcoming FOSS4G 2019 took place. 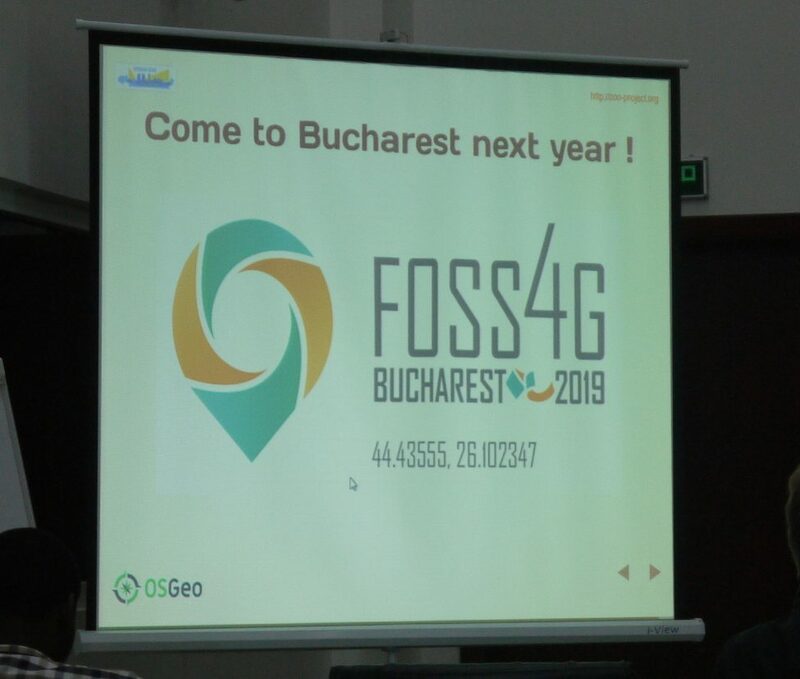 We are delighted that FOSS4G 2019 will take place in Bucharest which for us is much easier to reach. 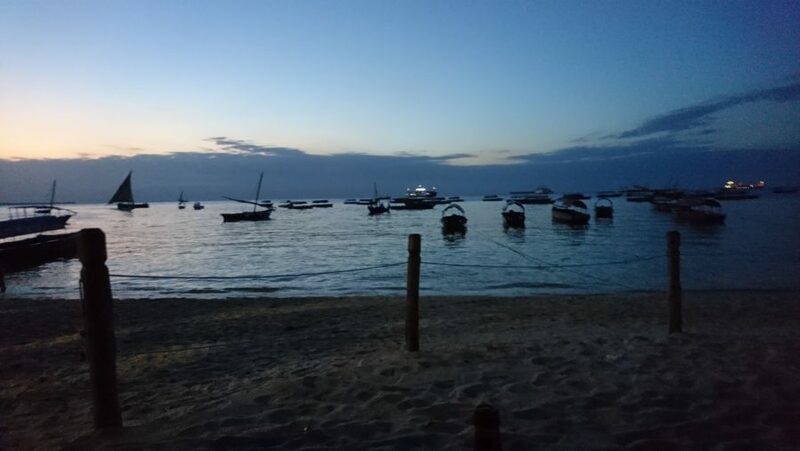 Since September 15, 2018 you can register here for FOSS4G 2019. We are going – who else?